When quality, price and service matter. #1 Source For Vinyl Fence. Factory Direct 24/7 - Fast Shipping! PRIVACY FENCE WIND CERTIFIED TO 130 MPH! 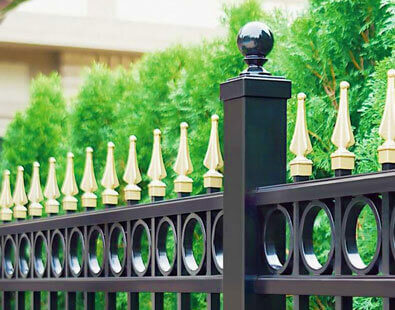 Heavy Duty Vinyl Fence Wholesale. Fast Worldwide Shipping! A+ 24/7 Customer Service. Online Leader Since 1995! Purchase wholesale vinyl fence factory direct and save money on the very best vinyl fencing manufactured today. Our heavy duty vinyl fencing is commercial grade, manufactured with the highest quality materials and thickest profiles available. 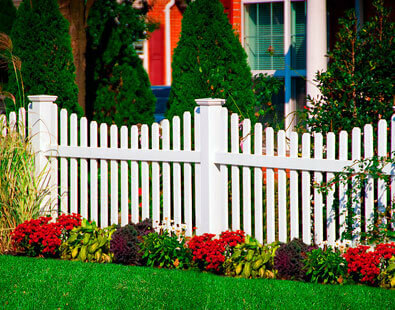 As premier vinyl fence suppliers, we offer fast nationwide shipping on all of our products. Most vinyl fencing panels ship in 3-4 days. 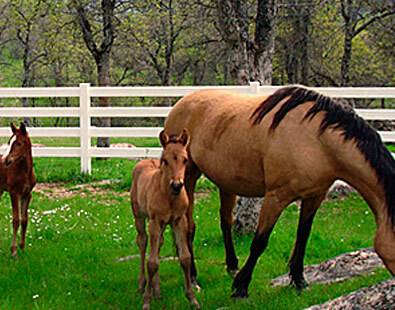 As the top vinyl fence manufacturers, we offer a huge selection of vinyl fence panels — including vinyl privacy fence, deck railing and vinyl horse fence — that add actual value to your property backed by our industry-leading transferable lifetime warranty. 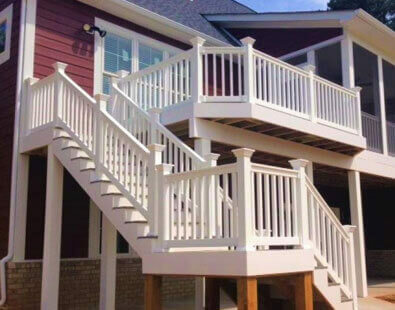 We provide the highest quality vinyl fencing and deck railing manufactured in USA. Contact us 24/7 for a free quote for your project. Largest selection of vinyl privacy fence panels and styles including: Simtek Simulated Stone Fence and Simtek Ashland Privacy Fence. 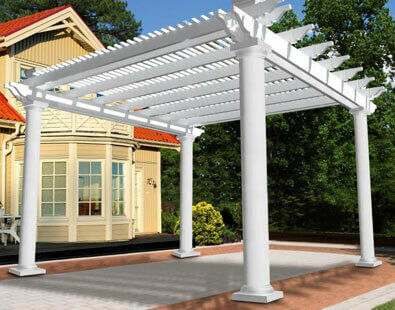 We specialize in commercial and residential projects both big and small. 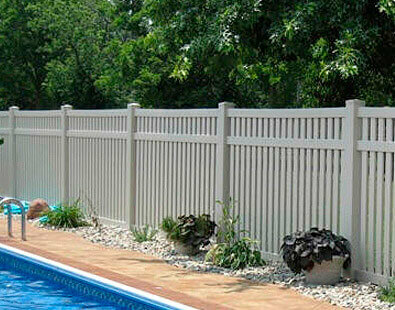 View our complete vinyl fence product line. Easy vinyl fence installation — no wood, brackets, or screws needed for our heavy duty vinyl fence panels — making installation and upkeep a breeze. 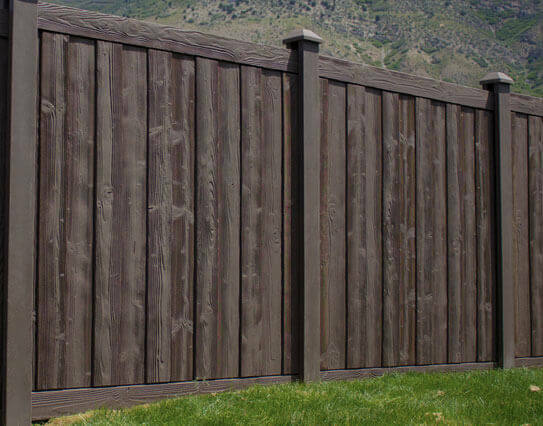 A variety of vinyl fence color options: white, tan, gray and clay and mocha walnut. 24/7 customer support and the best shipping, packaging and customer service in the industry. Contact us for a free quote. A variety of vinyl fence accessories are available including: post skirts, lights, and gate hardware, plus a huge selection of vinyl post caps, including solar post caps and low voltage post caps. Our vinyl fencing is a huge step up in quality compared to the PVC panels you can find at your local big box stores, and we offer a transferable lifetime warranty. Most orders ship within three business days. We are always here and ready to help you because we want to earn your business! Ashland Privacy Fence is a simulated wood shadowbox privacy fence. It features beautiful wood grain panels available in four unique colors: nantucket gray, red cedar, brown walnut and golden cedar. Just like Simtek simulated stone fence, Simtek Ashland privacy fence is shipped pre-built and installation is fast and simple. The natural wood grain panels will not fade or discolor. Ashland is wind certified to 130 mph and backed by a lifetime warranty. It offers the beauty of wood without the maintenance. Contact us 24/7 for a quote. 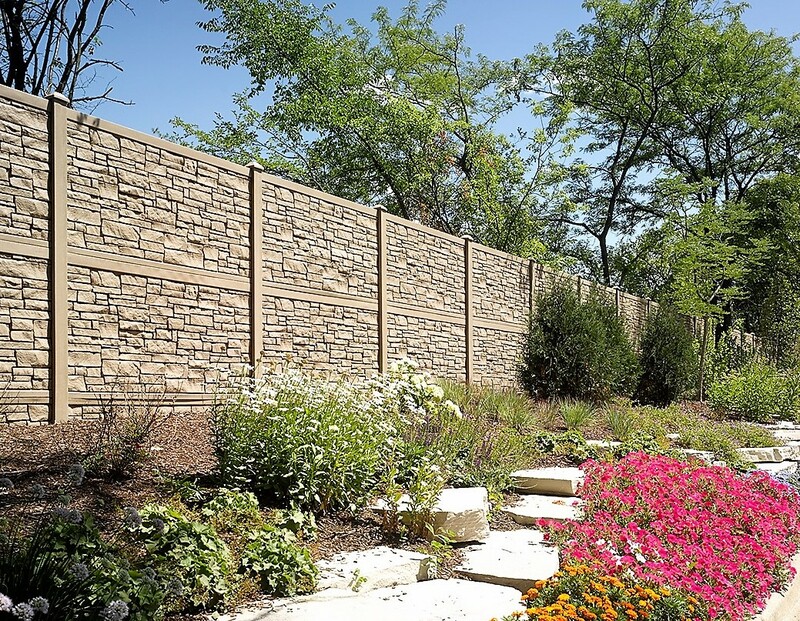 Simulated Stone Fence is possibly the most beautiful privacy fence manufactured. It is wind certified to 130 MPH. All of SimTek Ecostone simulated stone fence panels are shipped pre-built and are easy to install. Go ‘green’ with EcoStone. Approved for commercial projects including sound wall and noise reduction projects. We provide six granite colors to choose from. Contact us 24/7 for a quote. Simulated Stone Fence is approved for IDOT sound wall applicatons. Available in many size options. 8 foot tall Sound Wall, 12 Foot Tall Sound Wall and up to 16 foot tall Sound Wall Privacy Fence. We specialize in extra tall privacy fences and sound walls. We work with the Department of Transportation (DOT) and the Federal Highway Administration (FHWA) in many states. Compared to pre-cast concrete sound wall panels, a SimTek Simulated stone sound wall will help your state reduce costs. Contact us 24/7 for a quote. Wind Certified Privacy Fence wind certified to 130 MPH! Watch our vinyl fencing 130 MPH Wind Test! Thanks for finding us online and viewing our company. In this day and age, everything is becoming automated and digital. It is almost impossible to find great customer service and support from an expert that actually cares about your project. In our industry poor quality products and bad customer service is the norm. This is exactly what makes us different. Working direct with the actual vinyl fence manufacture can make a big difference for your project, plus it will save you money, stress, and time. Our goal is to provide you with a great experience from start to finish. 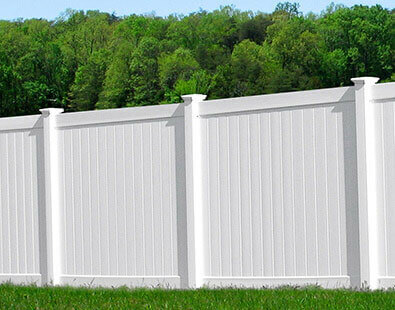 We work hard to provide excellent customer service and support, along with the highest quality and strongest vinyl fence products manufactured in USA. We invite you to get to know us and you will find that we are not the same as your local big box store that only cares about the bottom line. When you speak to us, you will see that we actually care about your project and are experts in our industry. We provide complete expert support. Vinyl fence is very basic to install. What sets us apart is the service we provide before, during and after your purchase. We are not the same as the big box stores and Giant Whale Corporations that only care about the bottom line and push their low grade cheap plastic fence that can blow away in the first storm. You will receive expert advice along with the very best vinyl fence manufactured in USA. When you have a question simply give us a call or email. You will not be dealing with a person working in the paint department nor the lawnmower aisle. We are fence experts and will provide you with expert support to ensure your fence is planned, ordered and installed correctly the first time! We understand each project is unique and your project is very important to us. We can help you through your entire project to ensure it is done right the first time. We are real people and not machines, we do not claim to be perfect. If ever we make a mistake, we always work to make it right. Please click through our site to view our extensive product line. When you have questions you can email or simply give us a call. We are always here ready to assist and hope to work with you on your vinyl fence project!